A Comedian Plays Ukraine's President On TV. Will He Become One In Real Life? Volodymyr Zelenskiy's only connection to politics is the role he plays in a hit TV series about a man who accidentally becomes Ukraine's president. He's leading in polls ahead of Sunday's elections. Ukrainian presidential candidate Volodymyr Zelenskiy walks backstage during the filming of the League of Laughter comedy show on March 19 in Kiev, Ukraine. The incumbent, President Petro Poroshenko, is struggling for second place against veteran politician Yulia Tymoshenko, who has served twice as prime minister. None of the 39 presidential hopefuls are expected to win an outright majority, meaning the top two candidates in Sunday's vote are likely to go on to a runoff election on April 21. "Every Ukrainian has his own idea of who Zelenskiy is," said Ivan Yakovina, a political commentator in Kiev. "He's giving an opportunity to imagine the best presidential candidate ever. That's why he's so popular here." 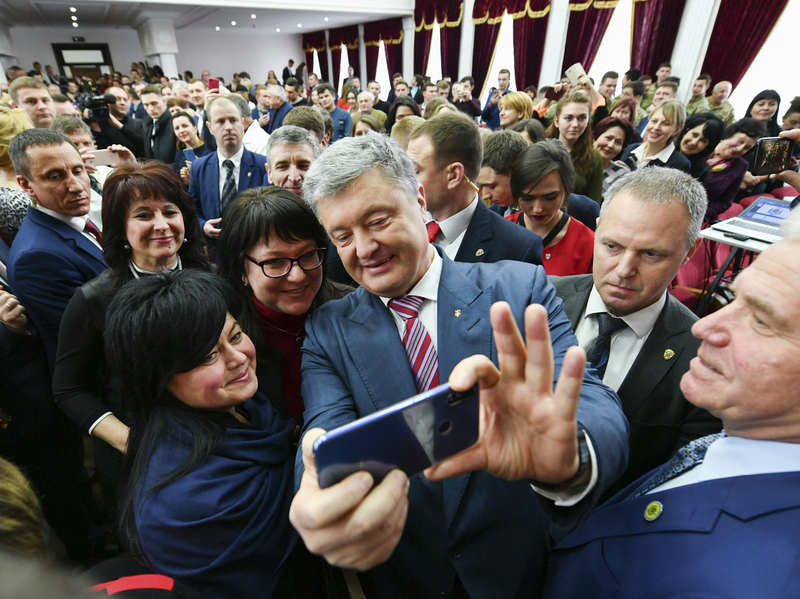 Ukrainian President Petro Poroshenko takes a selfie with students in Kiev, Ukraine, on March 25. He is struggling for second place against veteran politician Yulia Tymoshenko. "He is not a protest candidate," insists Dmytro Razumkov, a Zelenskiy adviser. "He is the only candidate who can unite the country in today's conditions." Zelenskiy announced his candidacy on New Year's Eve, saying he was motivated by a desire to bring positive change to Ukraine. His TV show, Servant of the People, depicts a high school history teacher who ends up on the presidential ballot after a video of him ranting against dishonest politicians goes viral. Zelenskiy doesn't make much of an effort to separate his fictional and political lives; the name of the political party that nominated him and will field candidates in October parliamentary elections is also Servant of the People. Passersby walk past a tent in support of former Prime Minister Yulia Tymoshenko in Kiev on March 26. None of the 39 presidential hopefuls are expected to win an outright majority in Sunday's vote, meaning a likely runoff. At Zelenskiy's headquarters in an upscale townhouse in Kiev, a dozen young people sit in a glass room, calling back voters who have requested campaign stickers or replying to questions submitted via Facebook about the candidate's positions. Zelenskiy promises bromides to slash red tape, return Russian-occupied territory to Ukraine and "not fight but defeat corruption." His appeal doesn't lie in any specifics of his platform but in the mere fact that he is a fresh face with no political baggage from the past. "I'm glad I could join something that will change my country for the better," said Nadezhda Tereba, 23, a campaign worker. "As a student, I want my future to be in my own country, here at home." Although the economy has returned to growth after the shock of the 2014 Russian military intervention, the country is dependent on international loans and can't provide enough well-paying jobs to its citizens. Some 5 million Ukrainians are estimated to have turned their back on a lack of economic opportunity and have worked abroad. "He's hardly a threat, but he's a serious competitor because there are enormous media and financial resources behind him," said Ihor Hryniv, the campaign manager for incumbent Poroshenko. "Zelenskiy was never engaged in politics and was never interested in it. This looks more like a project of Ihor Kolomoyskiy." One of Ukraine's richest men, Kolomoyskiy is an opponent of the current president and owns the 1+1 TV channel that airs Zelenskiy's shows. The comedian has made light of accusations that he is in Kolomoyskiy's pocket — and his adviser Razumkov flatly denies them. Poroshenko himself owns a business empire, including chocolate factories and Ukraine's Channel 5. "You have a political-economic system where a handful of people control major sectors of the economy, so much so that it dominates the political and the judicial systems and even the media," Kurt Volker, the Trump administration's special envoy on Ukraine, told NPR. "I think if Ukraine is really going to progress as a country, it needs to find a way to get beyond this oligarchic system." At the same time, Volker said, the upcoming election is a "fundamentally competitive democratic process" in which the winner is anything but foretold. In fact, there are so many candidates that there could be confusion at the ballot box. 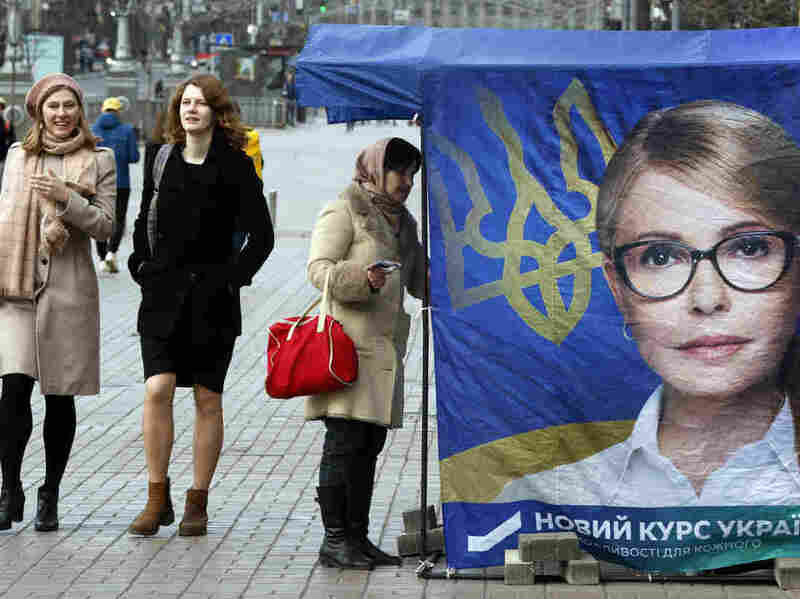 Campaigners for Yulia Tymoshenko, a fixture on Ukraine's political scene, question the appearance of an obscure presidential hopeful named Yuriy Tymoshenko. "For old babushkas in the precincts, that might be a problem to distinguish where is Yuriy, where is Yulia," said Hryhoriy Nemyria, an adviser to Yulia Tymoshenko. "According to some pollsters, that would eat up from 0.5 to 1 percent of the vote." In Sunday's fiercely contested first round, every vote will count. "I believe in her and that she can change what's going on now," said Oleksandr Dudnik, a retired driver who was handing out Tymoshenko campaign flyers near the presidential office in Kiev. "I want life to get better, at least for our children and grandchildren. Under socialism, we had work and money and food. We didn't want for anything." However, such nostalgia for the Soviet past is fading, especially among Ukrainians who grew up after the country's independence in 1991. Kiev computer programmer Dmytro Myakotniy, 32, says he hasn't decided whom he will vote for, though he rejects comedian Zelenskiy because he speaks "nonsense" and doesn't have a plan of action. The incumbent, on the other hand, is wrapping himself in the patriotic slogan "army, language, faith," while the people's real problem is widespread poverty, Myakotniy said. As the campaign draws to an end, Poroshenko is pounding home the message that he is the only candidate who can stand up to Russian President Vladimir Putin. The Kremlin has frozen negotiations with Poroshenko in advance of the elections, and Nikolai Patrushev, head of Russia's Security Council, has said that relations will not improve if Poroshenko is re-elected because his government "carries out the orders of his American supervisors." But analyst Yakovina warns there's a real danger that voters won't believe a Poroshenko win and will take to the streets. "If the elections will be rigged, the whole situation might end up in violence," he said. "I'm very afraid of that."